Pumpkin Fried Rice. Pumpkin puree was one of my sons’ favourite foods when they were babies and ever since they turned toddlers and prefer more chunky food, I haven’t cooked pumpkin for them. 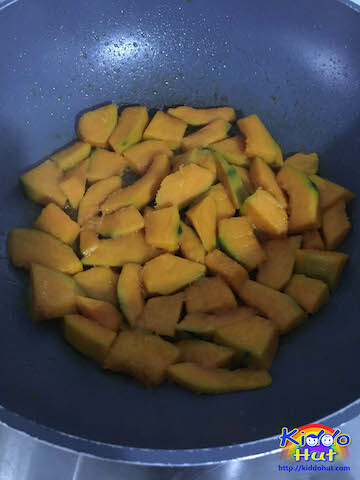 In view of a cooking challenge posted by one of the Facebook pages – Singapore Home Cook that requires Pumpkin as a main ingredient for the dish, it struck me to whip up some food using pumpkin for my family. How does Pumpkin Fried Rice sound? Savoury staple food with some natural sweetness from the pumpkin. In fact, I have posted another staple food using pumpkin – Steamed Pumpkin Bun / ManTou. 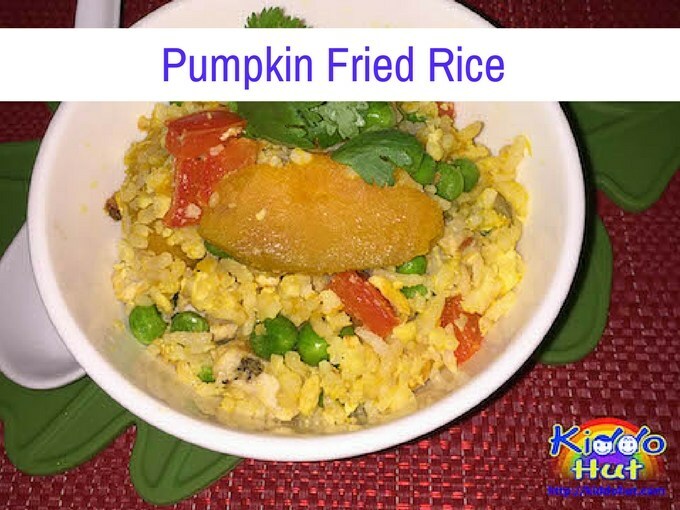 The key to making this dish is to avoid the pumpkin becomes soggy or mashy after frying with rice, and it shouldn’t be too dry, otherwise it will be difficult to swallow. Firstly, the pumpkin has to be cut in chunks (for steaming) or slice (for pan-fried). Then, you can either pan-fried the pumpkin first or cooked the pumpkin through steaming. I do not have an oven at this moment, so unable to test cooking the pumpkin by roasting which I think can be a way to avoid from getting soggy. The cooked pumpkin should be added last after all ingredients including the fried rice are ready to serve. Depends on your taste preference. Personally I prefer pan-fried pumpkin but for my kids, I steamed it. 1. Steam pumpkin chunks for 15 minutes. Or, pan-fried the sliced pumpkin until cooked. As pumpkin is not easily cooked, it should be pan fry till the outer layer is a bit crisp then add some water to simmer. Add water bit by bit as it needs to be cooked till water is evaporated yet pumpkin cannot be overcooked. Set aside. 2. Stir fry shallot until fragrant then add garlic, stir fry. Add chicken tight and stir fry until almost cooked. 3. Add in peas and stir fry for 1 minute. If the vegetable is raw, stir fry till it is cooked. Strain all ingredients and set aside. 4. Heat the wok or pan. 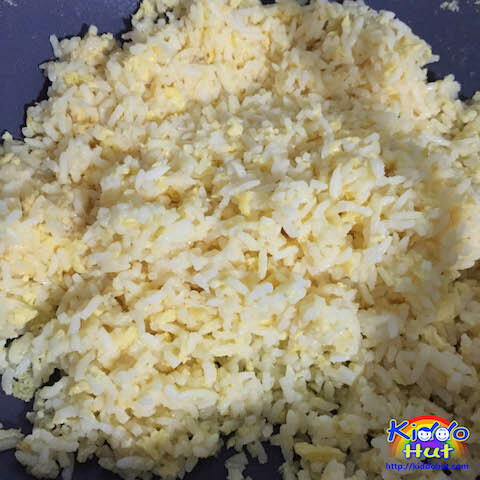 Pour beaten egg, stir fry quickly for 10 seconds at low-medium and add cooked rice. Stir fry until egg sticks onto the rice and the fried rice is dry. 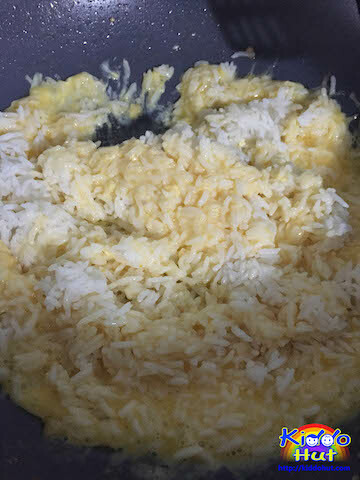 Pour cooked rice over beaten egg. Looks runny. Still looks wet. Not ready yet. 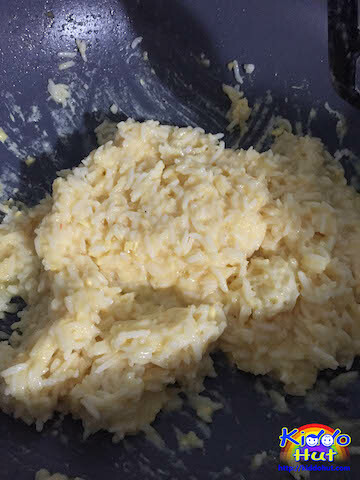 It is ready to add other cooked ingredients. 5. Add in the cooked ingredients and stir fry for 30 seconds until well mix. Add cooked pumpkin and stir fry till well mix. Then Add salt and pepper to taste. 6. Scoop into a bowl, garnish with some cut Chinese parsley and serve.